Pulverized Coal Injection (PCI) is a process that involves injecting large volumes of fine coal particles into the raceway of a blast furnace (BF). This provides not only a supplemental carbon source but also speeds up the production of liquid iron besides reducing the need for metallurgical coke for reactions in the blast furnace. The desire to move away from the production of the metallurgical coke with its inherent environmental problems has motivated the use of pulverized coal injection in blast furnace. 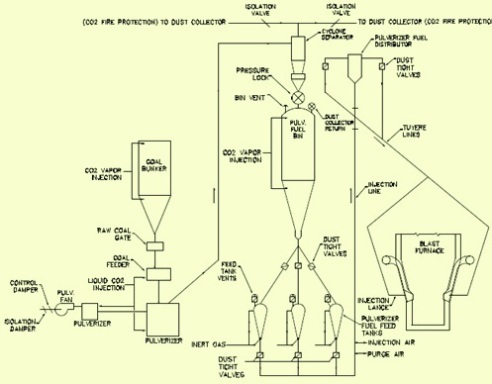 Pulverized coal injection was developed in 19th century, but was not implemented for industrial use. In early sixties of the last century PCI was successfully implemented in AK Steel of USA and Shougang in China. Though trials in several countries at that time had proved that the technology for pneumatic transport and injection of coal were available, but the economics and relative ease of the process was such that oil and natural gas injection became more popular. During energy crises of seventies people started showing interest in the process of PCI. This process developed very fast during 1980s and in the second half of the 1980s there were successful practices of coal injections at rates ranging from 180 Kg/tHM to 200 Kg/tHM. In nineties PCI technologies became mature. But the real shift to PCI has taken place only when the cost of metallurgical coke started rising due to the increased global demand. The PCI technology is based on the simple concept of carrying the finely ground (pulverized) dried coal by a conveying gas (normally nitrogen) to the blast furnace where it is distributed to different tuyeres and injected through a lance in the blow pipe. In the blow pipe it is mixed with hot blast and then supplied to the blast furnace in the raceway. The raceway propagates coal and coke combustion and melts the solid iron ore, releasing molten iron. The process description is as follows. Raw coal is pulverized, dried and then pneumatically conveyed to filters in a once through system. Coal is dried thoroughly to prevent saltation and compaction. The pulverized coal is deposited in a single reservoir bin and stored under inert conditions. The flow rate of the pulverized coal is regulated by inert gas pressure as a function of feed tank weight change. The single stream of dense phase coal from a feed tank is combined with transport gas (nitrogen) at the mixing tee. A single transport pipe carries the coal/gas mixture to a coal distributor located at the blast furnace (Fig 1). 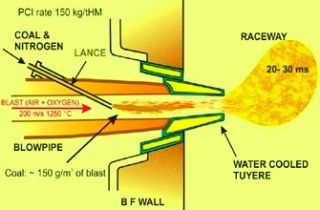 At the distributor the single stream of coal/gas mixture is divided automatically into multiple equal streams and conveyed by a pipe into each tuyere for injection into the blast furnace. A block detector system guards against tuyere blockage. The main features of the pulverized coal injection process are as follows. 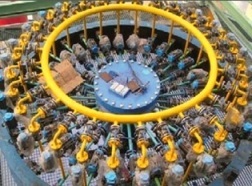 In the closed loop system, the emitted gas from the filter is partly recirculated to the inlet of the pulverizing mill. This creates an inert condition which minimizes the oxygen content in the system and reduces the chances of coal dust explosions. Blast furnace stove waste gas along with BF gas in case of necessity is used as source of energy for coal drying thus reducing the consumption of primary energy. The moisture of the coal can be removed from the system very effectively without the use of a gas cooler or condenser. The use of inert gas during the operation of the reservoir bin reduces the risk of fire and explosions. The total weight of the injected coal is controlled precisely by a load cell system which adjusts continuously to meet the set point. The parallel arrangements of the feed tanks ensure continuous flow of the coal into the blast furnace. The coal distribution system is simple and effective with no moving parts. The injection rate is normally controlled by modulating the position of a metering valve mounted at the discharge of feed tanks. The system ensures even distribution of the injected coal between the total numbers of tuyeres and has inherent capability to redistribute automatically the total coal injected into the blast furnace in case injection is discontinued in one or more tuyeres due to any reason. Pressurized nitrogen is used for injection of pulverized coal from the feed tank into the transport line. With a small amount of additional transport gas, the pulverized coal is conveyed and injected into the blast furnace under dense phase conditions. In such condition loading of around 40-50 Kg coal per Kg of gas is achieved in the coal conveying line. The coal is conveyed in the pipeline at a speed of only a few meters per second. Low conveying speed of the coal reduces the wear in the pipe thus increasing its life. Dense conveying system is powerful and can transport the pulverized coal to long distances. The productivity of blast furnace improves since coal injection is accompanied with oxygen injection. Injection rates are higher than the injection rates of other fuels such as oil and natural gas. Coal grinding and injection systems are non polluting systems. Hence the overall pollution from coke production for iron making gets reduced by injecting pulverized coal in the blast furnace. Coal supplies are relatively stable when compared with the petroleum fuels supplies. Coal injection system is less costly than the cost of an additional coke oven battery. Lower capital cost means lower depreciation and interest to be charged on hot metal. very good brief about pci. Very good article, I had good learnings after read the whole. Requirement of oxygen addition in cold blast w.r.t. pci rate may please be elaborated. How to prepare the furnace to accept more than 100kg/thm? this is one aspect which is bothering all Blast furnace operators particularly in Inda.very few blast furnaces in India are capable of accepting more than 130kg/thm coal on consistent basis.